Quantum Limit.com: Kon Tiki Sails Again! There are momentous things that shape our lives. Sometimes it is a person. Sometimes it is an event. Sometimes it is even a book. 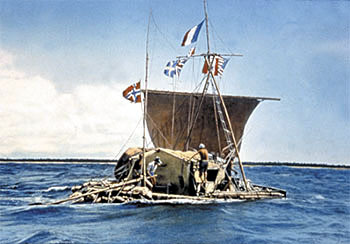 One such book in my life was Thor Heyerdahl’s Kon Tiki. His incredible adventure – crossing the south Pacific in a balsa wood raft – was so amazing and interesting to me as a young man, that it helped shape my attitudes and helped me formulate my opinions on life and adventure and the capacity of man to achieve even incredible dreams. The great Heyerdhal adventure was a research expedition. It was designed to prove that such grand rafting exploits were, in fact, the settlement routes from South America to the Polynesian islands. Unfortunately, his success didn't much to support his theory, even at the end of his amazing adventure and many thought he would sail over the vast horizon and never be seen or heard from again. As for me, I'll side with Heyerdhal. At least he proved his point and all the argumentative anthropologists have to show for themselves are various colored lines on paper. Sorry guys - no guts, no glory. This week, Thor Heyerdhal’s grandson Olav has set sail again – on a near-duplicate raft built in the same way as was his famous grandfather’s raft – setting out on an identical voyage. It will be of great interest to me to follow this expedition, and for many of the same reasons Olav is himself doing it. It will be for a tribute to one of modern man’s greatest adventures. It will be, once again, in memory and tribute to the original rafters who dared to venture out onto what to them was truly unknown voyages – for these people truly were never heard from again. But the voyage’s purpose will also be to check out one rather intimidating data point. Of the original rafters, what was considered a success probability? One in two? One in five? One in ten? For modern man, there is only one data point – Thor Heyerdhal. Now we have two – Thor and his grandson Olav - and one is in progress. Let us sincerely hope these modern voyagers thought to bring a satellite beacon for rescue and a rubber raft, just to be sure. While the data point of success at the end of the voyage is desirable, the "missing at sea and presumed lost" does not help anyone's theory and would be a sad tribute indeed. Shown above is Olav’s raft – a spitting image of his grandfather’s. And, be sure and check out their detailed story here.